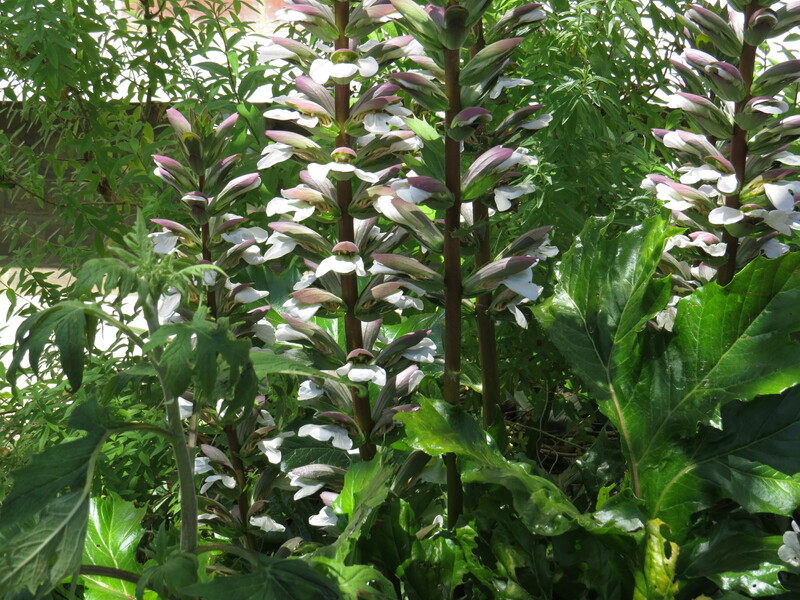 Dear Readers, what a striking plant this is, with its dark brown bracts and gently striped white flowers! Although it does grow wild in some parts of the UK (and was probably introduced from Italy in the 16th Century), in East Finchley it is confined to gardens. It is what many gardening books call an ‘architectural plant’, which generally means something strident and upstanding, but Acanthus has played a part in the architecture of the Classical world in a much more direct way. The leaves of the plant are magnificent in their own right, as you can see from the photograph below. 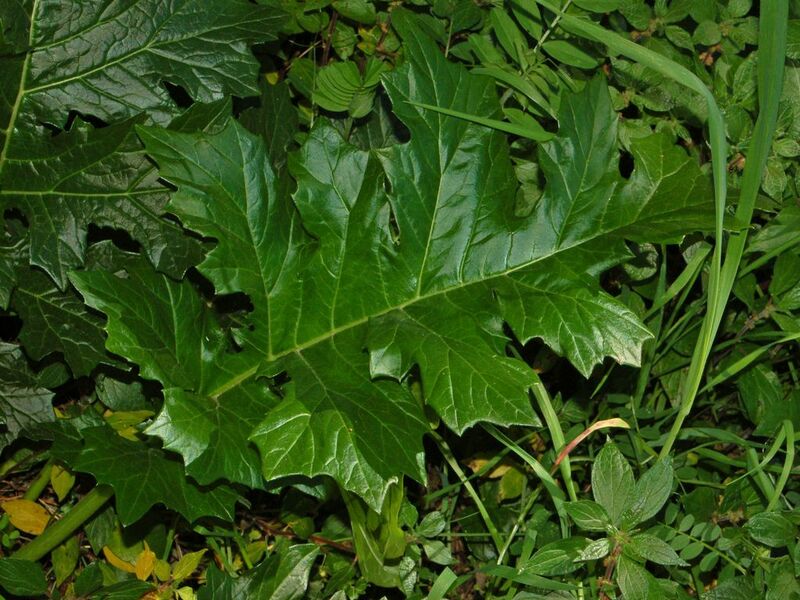 The name ‘Acanthus’ comes from the Greek for ‘thorn’, probably because of the spiky leaves and seed capsule, but the species name ‘mollis’ means ‘soft’, maybe to distinguish this plant from it’s much spikier relatives. I assume that the name ‘bear’s breeches’ comes from the way that the flowers look like trouser legs protruding from the bear-coloured bracts, but why it is also sometimes called ‘oyster plant’ I have no idea. 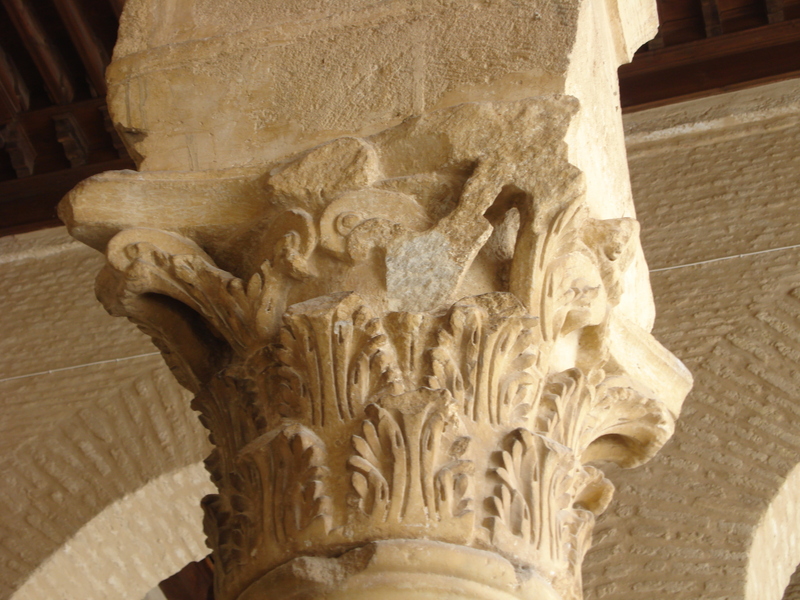 The leaves were the inspiration for the top part of the Corinthian columns (the Capital) used in Greek buildings from the 5th Century BCE. The design is attributed to the architect Callimachus, who is said to have seen Acanthus leaves growing around some statuary on a grave and been struck by the beauty of the accidental arrangement. As the plant is widespread throughout the Mediterranean, it is not surprising that it became synonymous with this particular era and style. Virgil states that Helen of Troy wore a dress embroidered with Acanthus leaves, and I suspect that she looked very good in it, though if legend is to be believed she’d have looked good in a jute sack. 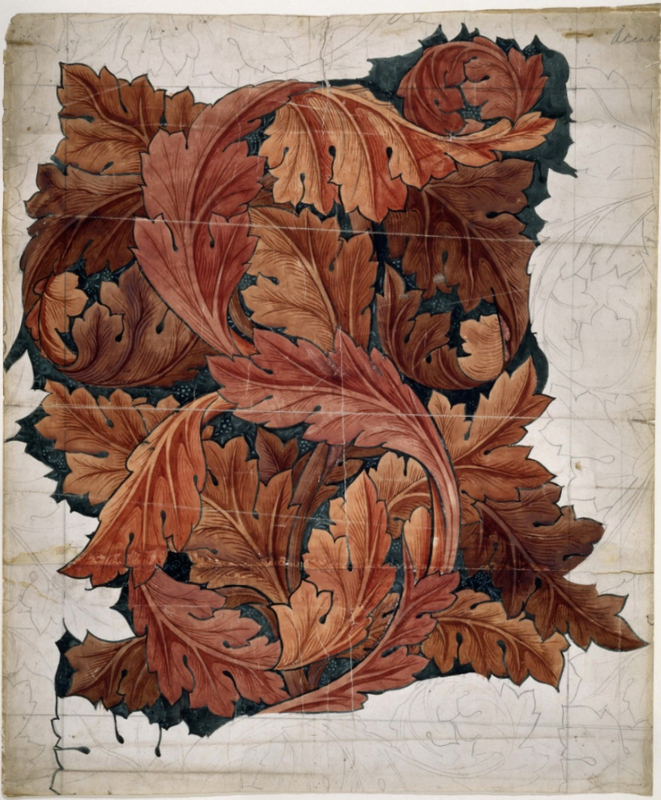 William Morris was also very taken with the leaves as a design for his fabrics and wallpaper. 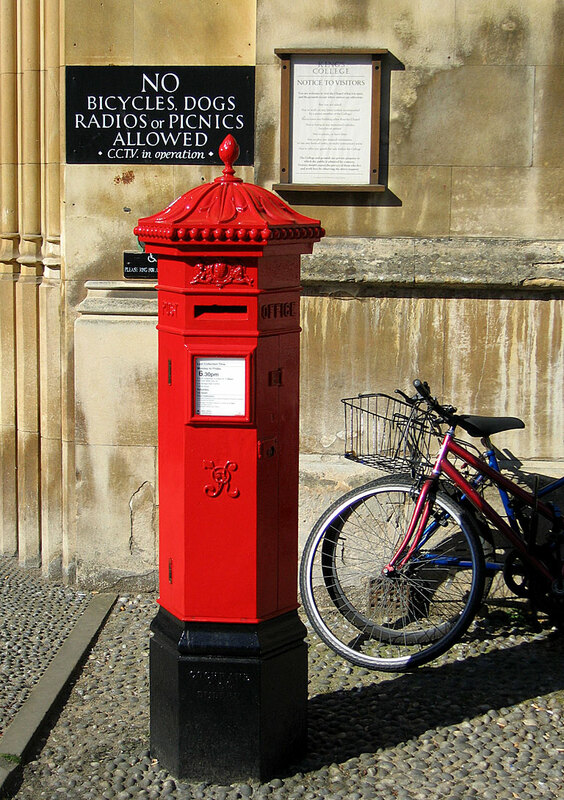 The design became so widespread that it even reached the post boxes of England during the Victorian era. 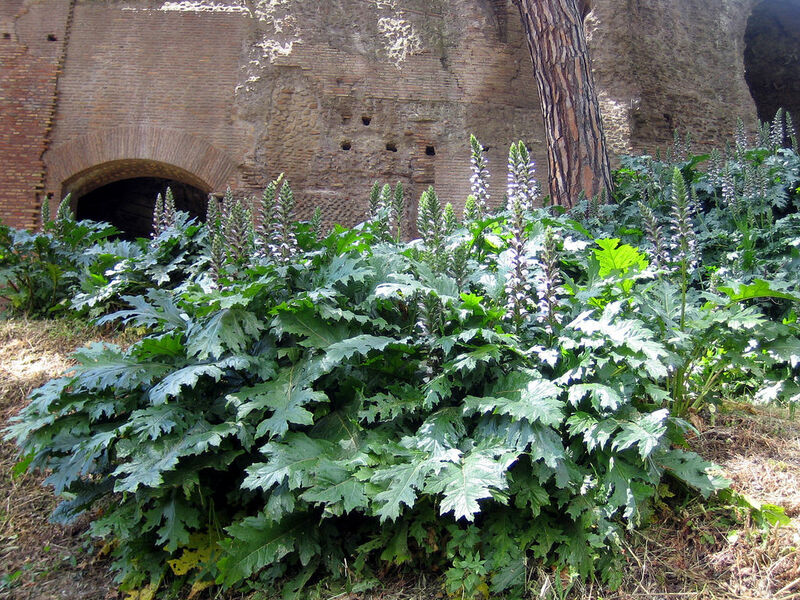 No wonder that, in the Language of Flowers, an Acanthus means ‘art’. Acanthus is what is known as entomophilous (or ‘insect-loving’), and is pollinated by big, heavy insects such as bumblebees, who are the only ones strong enough to force their way into the flower. The plant also spreads by means of its rhizomes, and can be quite invasive in the right conditions. It is a remarkably unfussy plant, happy in shade or in drought, and it certainly packs a punch appearance-wise. I need to have a garden about three times as large as my current one to accommodate all these plants that I keep finding out about. Medicinally, the leaves were used as a poultice for burns and scalds, sprains and dislocations. Tea made from the leaves was also used to soothe digestive and urinary upsets. I can find no references to anybody (except snails and slugs) eating the leaves, though they don’t appear to be poisonous either. Better to stick to that bag of curly kale, I think. And finally, here’s a poem, to balance the Ted Hughes that I posted a few weeks ago. This is by Sylvia Plath. I suspect she might have invented the word ‘Acanthine’, and this poem is a remarkable evocation of Plath’s father, who died when she was eight years old. You could say that she searched for him, in vain, for the rest of her life. Pieced, glued, and properly jointed. Proceed from your great lips. It’s worse than a barnyard. The bald, white tumuli of your eyes. You are pithy and historical as the Roman Forum. I open my lunch on a hill of black cypress. In their old anarchy to the horizon-line. To create such a ruin. Counting the red stars and those of plum-color. The sun rises under the pillar of your tongue. My hours are married to shadow. On the blank stones of the landing. This entry was posted in Uncategorized on August 1, 2018 by Bug Woman. 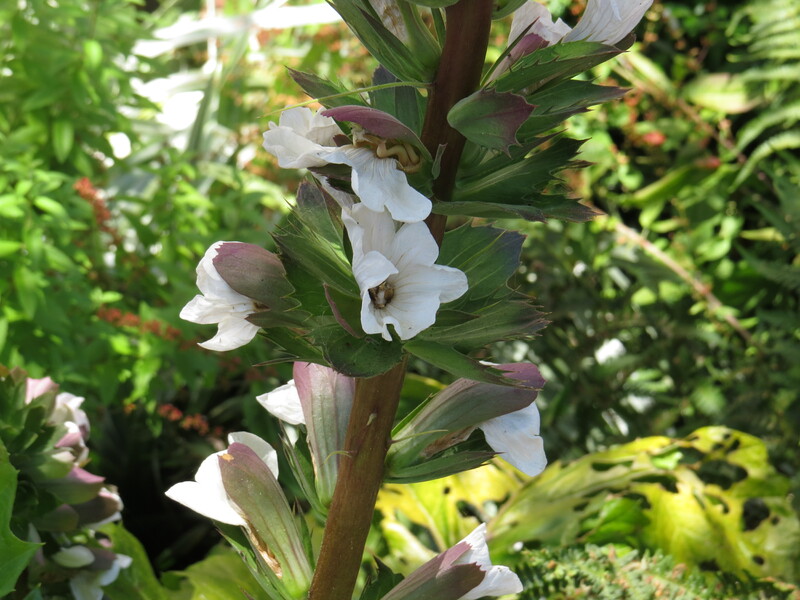 I have been attracted to Acanthus (Bear’s Breeches) for a long time. If I had room I would plant it in my garden. I like knowing more of its history and use in art and architecture. It can be quite a tough weed. It does quite well in the shade of the redwood forests. Your description is very similar to how we learned about it in school. I distinctly remember the term ‘architectural’. The State Capitol in Sacramento is outfitted with the acanthus motif, just like such buildings in Europe are.